A different musical concert is on tonight that combines tradition with Cretan music and Byzantine sounds like a trip in Greek space and time! 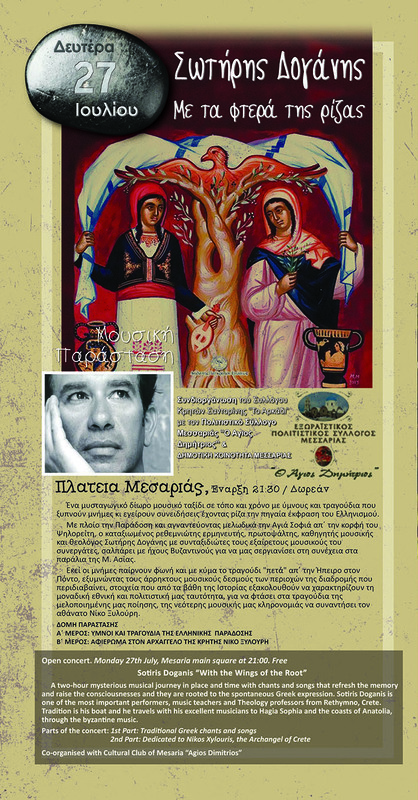 This is all about the presentation of the new discography work of Cretan artist Sotiris Doganis titled "With the Wings from the Root". The first part of the show includes songs and hymns of the Greek tradition, while the second part is dedicated to Crete and Nikos Xilouris. The live concert is co-organized by the Cretan Association "Arkadi" and the cultural association of Messaria in Messaria Square at 21.30 with free admission.